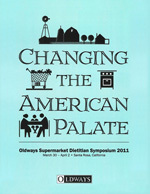 Supermarket dietitians and other food industry professionals joined forces at Oldways’ 2011 Supermarket Dietitian Symposium March 30 to April 2 in Santa Rosa, California, to develop solutions to address our nation’s health and obesity crisis. By invitation, almost 40 retail dietitians from across the nation came together to share ideas and strategies to improve healthy eating and purchasing behavior in our nation’s leading grocery stores. This supermarket networking event for food and health professionals included in depth sessions with more than three dozen speakers, who shared ideas for promoting better nutrition and healthier food choices in supermarkets. See more details on our blog. For many of the sessions listed below, copies of speakers’ presentations are available. (Some panels were discussion only, without presentations.) Click on the links to download each presentation. Remember, however, that speakers normally add considerable information orally that is not available in the PDFs; not all presentations will be completely comprehensible without this additional oral detail. While we oﬀer these presentations for their educational value, we remind you that these works are copyrighted by each speaker and may not be reproduced without the speaker’s written permission. Rosie Benner, RD, LD, H-E-B Grocery Company with Caroline Whitby, MS, RD, LDN, Giant Eagle and Rosanne Toroian, Schnucks Market Inc. Thanks to sponsors Del Monte and Frito-Lay (Top Level); Barilla, Quaker, California Avocado Commission, Food Match, MilkPEP, Vestcom, and The Almond Board (Level 2); The Peanut Institute, Crunchmaster, The Mushroom Council, Eggland’s Best, General Mills / Green Giant Frozen Vegetables, American Heart Association Food Certiﬁcation Program (Level 3); McCormick, Tuna Council, Stonyﬁeld / Oikos Organic Greek Yogurt, Cabot Cheese, Solae (Level 4) for supporting this event.